Episode 25 Latin. Aquila means eagle. Palmon + OO Called "The Giant Eagle of the Desert," you can't hide from his sharp eyesight! 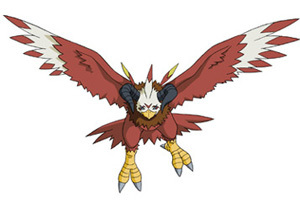 Has the power of "sky"
If the opponent is an Beast Digimon, attack power increases by 20. Alraumon + OO A sudden dive from high in the sky! His high speed attack is faster than the speed of sound!! Has the power of "sky"